The Drama Desk nominated, New York Innovative Theatre Award winning RadioTheatre will present six of the greatest stories written by the grand master of horror himself, HP Lovecraft, live and onstage for the first time ever as part of THE H.P. 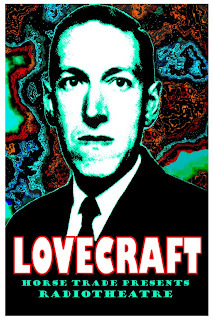 LOVECRAFT FESTIVAL, March 17-April 3 at The Kraine Theater (85 East 4th Street). A man is shipwrecked on a strange island where he finds a lost world of fish people. A mad scientist goes where no man has gone before. Just how does the artist Pickman get such remarkable detail in his horrifying paintings? A seminal work in Lovecraft's famous Cthulu mythos wherein a backwoods family worships the ancient ones who will return one day to destroy mankind. A weird pianist plays maddening music that is indescribable. Tickets ($18/$15 students) are available online at www.horseTRADE.info or by calling Smarttix at 212-868-4444. All performances are at The Kraine Theater (85 East 4th Street between 2nd Ave and Bowery). Now in it’s 7th Season Radiotheatre combines the artistry created during the Golden years of Radio when Sound was king and Story Telling, along with great voices, music and sound effects…as well as, the individual imaginations of its audiences…were the primary ingredients used to provide a memorable, live, theatrical experience. Of course, we do like to add some 21st Century touches…such as cinematic scripts, fully scored orchestral sound tracks which you won‘t hear anywhere else, a plethora of aural effects and, sometimes, a few visuals, too…creating a unique production with non-traditional, modern, innovative stage presentation! HORSE TRADE THEATER GROUP is a self-sustaining theater development group; with a focus on new work, it has produced a massive quantity of stimulating downtown theater. Horse Trade’s Resident Artist Program offers a home to a select group of Independent Theater artists, pooling together a great deal of talent and energy. It is also the home of FRIGID New York – the first and only festival of its kind in New York City.